An individual who feels truly free… free to be himself, free to speak his mind, and free to take risks will be happier, healthier, and more courageous. And this will lead to increased empowerment, accountability, and innovation. 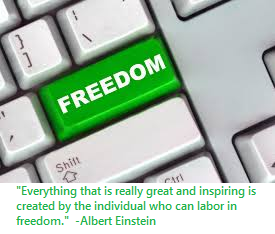 As we think about our own organizations, do we have a culture of freedom and independence or one of fear and subordination? As we manage our teams, are we developing leaders or only followers? Are we delegating ownership and accountability or merely complexity and uncertainty? This is not to say that we should replace our hierarchies with anarchies, but are their ways that we can better create a culture in which our leaders serve the organization more than the organization serves the leaders? Essentially, what can we do to help our people to “declare their independence” and to help each individual to lead, to work, and to innovate under the blanket of freedom? Fairness, Not Sameness. A critical trait in being an empowering and successful leader is the ability to treat each individual fairly. A critical mistake, however, is in equating fairness with sameness. Every person has different talents, approaches, and work ethics, leading to a wide range of behaviors and results. As such, different approaches, different responsibilities, and even different rules can and should apply to different people. This is not to say that we should fail to provide equal opportunities to our people, but we must acknowledge, respect, and reward differently according to the unique capabilities and potential of each individual. This spring I coached a 7 and 8 year old softball team, and the girls came to the first practice with a wide range of experiences and skills. It was clear from the beginning that every girl wanted to play first base- that is an important role and one that gets more action that most other positions on the field. However, to play first base a player must be able to catch the ball- not only to help the team to be successful in the game but more importantly for their own safety. When the season started, only a handful of girls were able to catch the ball consistently enough to safely and successfully play first base, and these are the girls who got all of the playing time. As the season went on, some of the other girls worked hard, practiced with me, put in extra time at home, and developed their skills… and thus got playing time at first base as well. While the playing time ultimately was not the same, it was fair… providing equal and evolving opportunities based on the individuals’ talents and results. As this relates to our organizations at work, this may translate to differences in project responsibilities, special privileges, or varying rewards. Yes, this means that some individuals will get “less than” others and may even feel slighted. However, for the overall good of the organization, this variance is critical as it recognizes and rewards critical talents, behaviors, and results and encourages the freedom to take risks, to grow, and to excel. Represent Your Team’s Vision and Approach. I believe that all management approaches can generally be boiled down to two basic philosophical differences. 1) As a leader, I am the single-point of accountability for the vision and strategy of my organization, and the individuals on my team are responsible for executing my vision, or 2) As the leader, I empower the respective leaders within my group to create their own vision for their work, and make myself accountable for helping them to bring their respective visions to life. Under the first philosophy, there likely will be more clarity and efficiency, but the breadth of work is limited by the capacity of the one leader. Under the second approach, the leader must give up some degree of control and assume additional uncertainty, but the breadth of work can expand exponentially as it now reflects the vision of multiple individuals. Also, under the first approach the organization will likely approach the work more as executors than as owners and be less invested overall, while with the second philosophy the organization will approach the work as architects and leaders assuming more personal accountability. Clearly I am a proponent of the second approach, as it will almost always lead to bigger initiatives, better results, and a more empowered culture. This is not to say to say that the leader should not have his own strategy and vision- this still remains critical. However, he should build and develop strong teams and empower them to develop their own plans and strategies for designing and delivering the work, and serve as an agent and barrier-buster to help bring their vision and approaches to life. Embrace Individuality. It is often now said that “Creativity is the new Currency”, when it comes to winning in business, innovation, and economics. At the same time, all organizations are consistently looking for ways to standardize work processes and approaches to drive scale and efficiency. While ultimately both are important, we must allow for some tension between the two and to give individuals some space for personalization in their approach to innovation and execution. Said differently, while we align with our teams on the “What” (the mission, success criteria, and objectives), we should let them manage the “How” (technical approach, research techniques, and team collaboration) how they best see fit. This is not to say that we should not guide, coach, and steer, but rather that we should help find ways to strengthen and support their individual approaches rather than to ask them to adjust into ours. Instead of saying “That is not how we do it here”, we should ask “How would you recommend that we approach this problem?”. This freedom will demonstrate trust, create ownership, and encourage creativity. Delegate Decision Space. One of the greatest gifts that can be bestowed upon an individual or a team is the ability to own and make real decisions about their programs and projects. Far too often, rather than delegate accountability to our teams, we instead delegate complexity. We make teams responsible for executing the work but not accountable for making critical decisions to move the work forward. This can create a culture where teams will always “ask permission” rather than to “beg forgiveness”. Instead, we should invest early in aligning with teams on the overriding success criteria (financial goals, timing objectives, resource constraints, performance criteria, etc.) and then allow them the freedom to make decisions on how best to satisfy those criteria. By delegating this decision space, teams will spend more time trying to meet project success criteria and less time worrying about how to persuade management on details. Additionally, “management” will buy themselves more freedom by getting out of the “weeds” of the projects and letting the team handle the details of how to execute the work. Getting clear at the onset on who is accountable for decisions, and delegating as may decisions as possible to the project teams will create accountability, drive efficiency, and encourage innovative solutions. Openness in Communication. “The best weapon of a dictatorship is secrecy, but the best weapon of a democracy should be the weapon of openness.” (Niels Bohr). We are all in this together, and for teams to truly feel freedom, trust, and ownership, there must be transparent and open two-way communication. Managers must be willing and able to provide big picture context and perspective to their teams, so that each individual on the team knows where his or her work fits in the grand scheme of things. Additionally, the team must be allowed and encouraged to communicate challenges and “bad news” to management without fear of retribution (and even be rewarded!). When collaboration channels are always open, both the teams and managers will be free to focus on solving the real issues, will treat each other as trusted partners in the process, and will proactively give each other information to drive greater work efficiency and better decisions. Motivate Not Mandate. Dwight Eisenhower said that “Motivation is the art of getting people to do what you want them to do because they want to do it.” Leaders should work with teams on developing a shared “rallying cry” and mission to deliver amazing business results. Teams don’t want to be told “what to do”, but rather “why it is important”. As leaders, if we can invest in helping our teams understand the problem to be solved, in inspiring them to own the solution, and in empowering them with the accountability to execute with excellence, we will be far more effective than if we spend our time on directives and micro-management. Our job as leaders is not to develop followers who execute for us, but rather to develop leaders who execute for themselves. Previous Batman in the Office… HERO or VILLAIN?